Welcome aboard. Whether you are here simply to admire the Firebird or are looking for a new assignment, we are glad that you have stopped by. 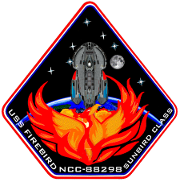 Our mission is embedded into the very nature of the Sunbird class of ships. In the aftermath of the Cardassian War, the relationship between Cardassia and the Federation has fundamentally shifted. Cardassia continues to try to rebuild from the war's devastating effects. At the same time, the Federation has taken on much responsibility to ensure the stability of the quadrant. More resources were needed and the Firebird represents a manifestation of that need. The Sunbird class starship is an emergency response vehicle, like no other in the fleet. While relatively small, the class possesses powerful industrial replicators, a robust medical staff and the ability to move large stores of consumables. 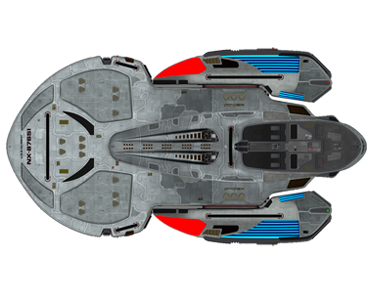 In short, the Firebird is a ship of action, responding to the most urgent and desperate cries for help. While she possesses weaponry enough to defend herself and more, she is intended to get where she needs to go faster than any other vessel. Does the cry for help move you? Do you have the skills to save lives and repair what is broken? Do you owe a debt for your own life? Come aboard! And remember our motto, Primum non nocere- First, Do no harm. Only a few can be at the tip of the spear. This award goes to our illustrious Assistant Chief Science Officer for a number of reasons: I am very impressed with the skill and thought that goes into Na's posts across all of his JPs. There is a dedication to clarity, nuance and thought provoking language that is hard for most people to sustain. I also appreciate how well the character's Betazoid heritage is integrated into the writing without being overbearing. It has also been a treat to see him interact with different characters, having come onto the ship right before the mission started. Finally, for all of the wonderful comments that he leaves on our mission posts. It is a pleasure to have him on board the Firebird and for these reasons and more, I award him my personal merit. "We are blessed with a plethora of well written, well rounded characters on the Firebird. Rhiana is certainly one of those. However, she is more than that. She's a Romulan. Alone in a crowd, trying to find a place that she feels at home and not quite getting there. But she doesn't let that push her into giving up. She keeps doing her job. She brings unique perspective and dialogue. She makes decisions that are true to her background and somehow keeps surprising us. Her JPs are always a treat." "First off in the simming community in general it is a fairly popular concept, a Romulan in Starfleet that is. But Rhiana handles that basic concept in a very unique way. She is not a fish out of water or Romulan simply biding time until the Empire can come back. She is a person who has embraces the Federation, but does it on her terms. Once more it seems that everyone on the crew has a unique respect for Rhiana both in character and out of character." "Rhiana really dazzled me this month and has been a consistently great writer in this mission. She manages to keep herself in that strict alien mindset with very alien ideals and motivations, but so well adapted for our timeline and circumstances." "This last mission was a great example of her writing. Her character is engaging and adds a lot to the story. Plus she is active on slack and always willing to be a part of the community." "I wish there was a badass award. Rhiana just keeps hitting it out of the park." "I like the ways that Rhiana surprises me as a character while staying true to herself. It's a good touch that Mel has handled well, and Mel as always is a steady presence on Slack." "Gianna's two flashback posts were awesome. I love the tension and emotion in the scenes with the "doctor". Absolutely compelling stuff." "I've been impressed more than once over the past several months how Liam makes it look easy to write a believable character of the opposite gender. Also, not to point out the elephant in the room, but he ice-picked his main OC's eyeball and even had unflattering-and-realistic psychological reactions from that character. THAT type of writing is really, reeeeeally hard to do IMO. It requires self-confidence, patience, and faith that your readers won't put the novel permanently back on the shelf while in mid-page of Chapter Two. It's the equivalent of reaching the final boss in a video game and letting your main character die because it would tell a more memorable story." "Everyone has done some fantastic writing this mission, as always, but I wanted to nominate Emily for crew's choice this month. It's been great to read how our resident precocious child is coping with this fish out of water situation. There's just the right blend of childlike naïveté with the humor we all love. :-)"
"For both, the current mission and the background story. Both types of post show a different person than what one has seen aboard, someone who is more than just jovial and friendly and good-natured. The grief and problems arising in both series are well portrayed and I really like how he remains a Starfleet officer through and through." I would like to sincerely thank those who have been with me since the beginning. The sim wouldn't have been successful without you. "On the planet of Far Wanderer, Nora has been consistently written in a way that demonstrates how to properly write a character who doesn't want the spotlight, the medal, or top billing. She's not portrayed as a wallflower, victim, loser, nor comic relief. She IS portrayed as being the sort of person you'd want in your escape pod while the ship is blowing up." "He's a great pilot. And he managed not to entirely crash the Firebird. He even managed to "fly" those hoverboards. I especially enjoy how it's obvious that the character absolutely loves to fly anything that can possibly defy gravity." [Library Excellence Ribbon] Petty Officer Third Class Gianna Djokovic and Lieutenant Murril Na. "No matter the character Liam portrays, they are all distinct personalities. They each have a different style, different actions, different ways of speaking. I admire when someone is capable of doing that. In addition to that, they characters are all interesting and it's always a pleasure to play with any of them. He makes it easy to write with him, being open for suggestions and always having interesting suggestions of his own. He never hogs a post or storyline, allowing others to express themselves." "John has been such a wonderful addition to the crew. He's brought more diversity to our JPs and has done so with aplomb. Every sentence he writes feels like it is well thought out. Master wordsmith indeed." "I've never really seen much of Leed. Often, it happens that rarely played NPCs have a tendency to be two-dimensional. Not so with Leed. I really enjoyed reading his interaction with Rees and the others. It made one forget that he's "only" an NPC and it made me curious to read more of him in the future." "I'm going to be lazy. There were plenty of people in this mission who deserve this award. I'm just hoping that I don't forget anyone: Rees Leed Beddite Kaya Lopt Potter Gia Emily Kalstri I'm not sure Emily and Kalstri qualify, since they're civilians, but they went through the same hardship as the others. They all survived being in the hands of Seekers more or less unharmed, which is already an achievement in itself. If I remember well, though, Llwyedd and Smith were captured by hostile Techlons, so they would qualify as well." "The perfect proof that you don't have to be a member of Starfleet to be great at your job - and that civilian characters /can/ have a place on a Starfleet vessel and be an active part of the crew and not merely a guest star. Also, it's so great to see an actual, active family relationship aboard. It adds depth to the character and also to the Firebird. I'm glad Jillian is a member of the crew!" "Harlan continually goes above and beyond. He is a professional, if a cranky one. But he is also one of the glue guys that keeps things going when they are looking bad. He helps the crew function and is the lovable grumpy bear." "I think that Gia and Emily started out as semi-antagonists to each other. But during the course of the mission, they grew closer. They shared hardships and suffering and each was the rock when the other was low. They took care of each other and buoyed each other up. They became like sisters, although it is sometimes arguable which is the older sibling in this pair. Emily certainly thinks that Gia is one of her very best friends." "Another duo that started out as virtual strangers but through the course of the mission, became friends is Beddite and Kalstri. Alone, neither would have had a very successful time. Their personalities meshed so well that they were able to overcome and care for each other." "For recruiting me. I'm still very grateful for Liam harassing me to join the Firebird. :)"
"Because he has struggled with many things but never gives up. Because he is a key component of our sim. Because we are all better when he is around. Because he has many stories left to write." This month I have watched Richard as he worked very hard to juggle responsibilities. He is writing in multiple JPs with both his own PC and NPC and also writing another character. He is on Slack throughout the day and healways has a positive impact on the community. I am impressed with his writing, especially with the depths of Commander Leed. I can't wait to see how Gantt continues to grow and deal with his upcoming revelation. Because of all of these things and many more, I award my personal merit to Lieutenant JG Soto Gantt. There were three very strong nominees this month but Gia ran away from the rest of the pack. The crew demanded that she be rewarded for her suffering and excellence. "I thought Gia's interaction with the Seeker was fantastic and elevated her character over the others in this month. Really great job." "I nominate: No Joy in Mudville This was a fantastic post with a well-built story narrative that kept me reading enthusiastically." "Liam is a great presence in the JPs and Slack. He's been active in spite of many challenges this month. I think he deserves the award for his steady participation. I hope the award saves him from Cthulhu's terrible grasp." "I make this nomination for a post still in progress. I approached Gianna with an idea for a backstory post for my character. I needed another writer to make the post more believable. Not only did they jump in with gusto, but their ideas have added to the post and the concept immensely. I am excited to get this side story completed, and with their assistance this will add a more believable side to Cyn." "Because Liam continues to be dedicated to the sim despite his obvious and heavy curse. He also has managed not to spread the curse to the rest of us. Finally, because Gia has been wonderfully written for this whole mission with nuanced emotion and thought provoking actions. Eye see her!" Awarded for six months of outstanding service to the sim.